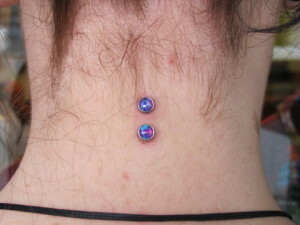 Nape piercing is a kind of surface piercing where the back of the neck or nape is perforated. 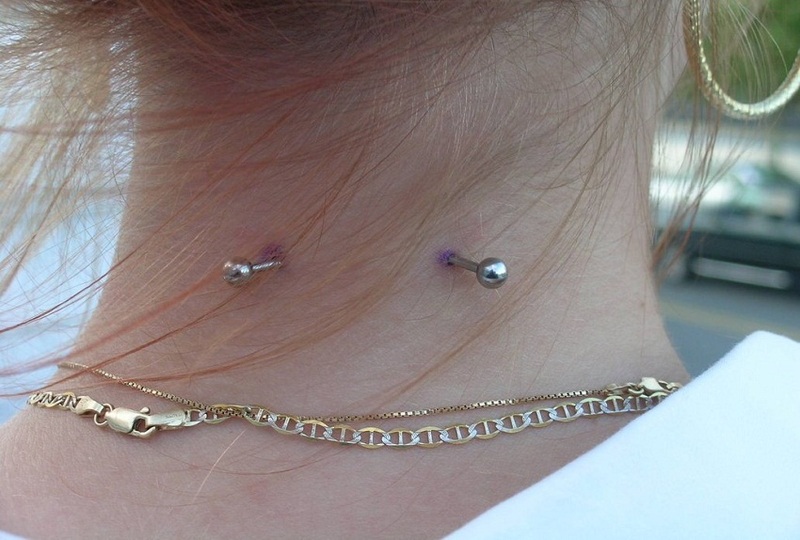 Though stylish and unique, this uncommon form of piercing has certain risks associated with it if not done in a proper way. Choose a good piercing studio for it to be done in a hygienic and proper way. 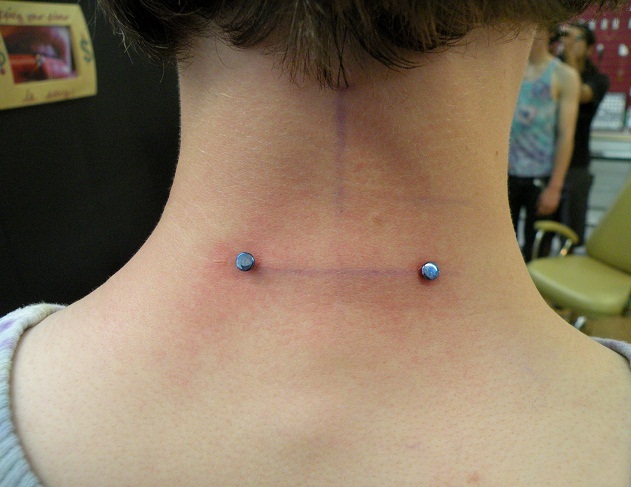 After completing the required formalities, the piercer will mark the ‘in’ and ‘out’ points using a temporary marker or a surgical pen after cleaning and sterilizing your nape. You will need to bend your shoulders while the professional goes on to place a clamp on your skin folds lying in the region between your shoulder blades. After clamping, a sterilized hollow needle is inserted into one hole and removed from the other. The piercer puts a surface bar or barbell and cleans the region using a disinfectant. 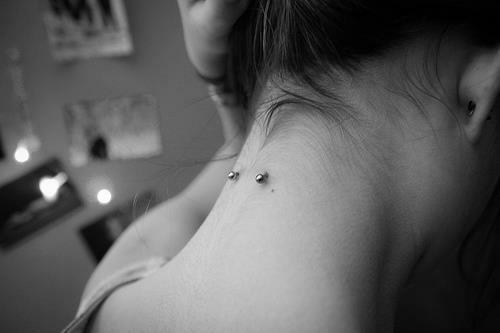 Like all other surface piercings, this one will also be painful though the level of pain varies from one individual to the other. 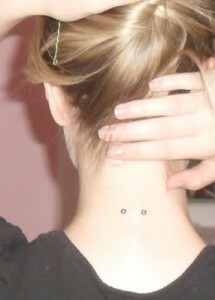 However, people who have got the back of their nape perforated say that it does not hurt that much. Wash your hands well with an antibacterial soap before touching the piercing to prevent infection of any kind. Apply saltwater compress on the perforated area using a cotton ball twice a day for five minutes till healed completely. If your hair is long, do it in a bun to prevent strands of hair from getting stuck to your jewelry, causing bleeding in extreme cases. Use a mild soap while bathing to prevent irritation in the pierced region. Exert pressure on the nape of your neck. Wear tight-fitting or high-necked T-shirts, scarves or necklaces during healing. The healing time spans between two and six months. Swelling or redness of the area may last for three to four days after piercing, however if it persists it is a sign of infection. Abscesses filled with pus indicates an infected nape piercing. When done improperly, nape piercing may run the risk of rejection. In fact, the body will see the jewelry as a foreign object, rejecting and pushing it out to the surface of the skin leaving behind a scar. Rejection might even occur when large-sized jewelry is used. Symptoms of rejection include nausea, chills, high fever, muscle pain, headaches and chills. In this kind of surface piercing, there is a higher chance of the jewelry to migrate from its original place, getting closer to the skin’s surface. 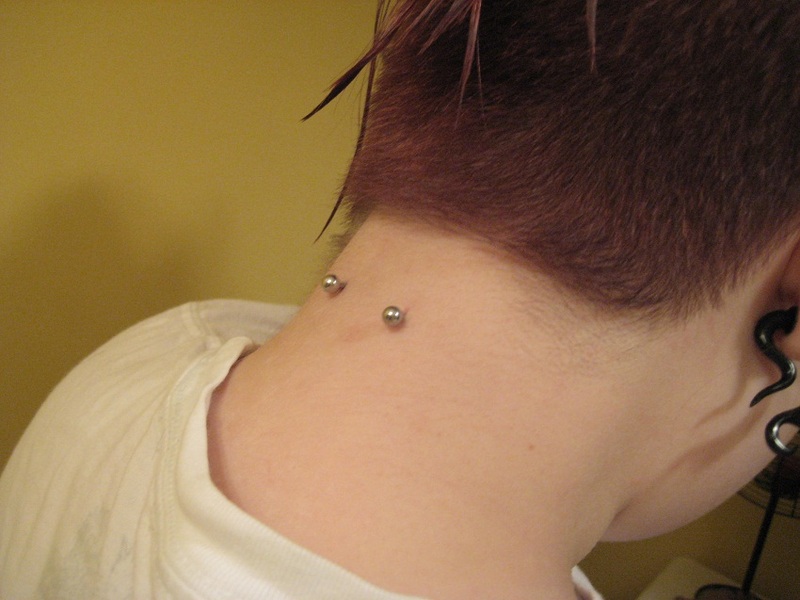 The myth regarding nape piercings causing paralysis is nothing but a misconception as the skin of this region has lesser number of nerves than other parts of your body. Moreover, the piercer uses clamps for raising the skin from the tissues, eliminating the risk of paralysis or any damage to the spine. 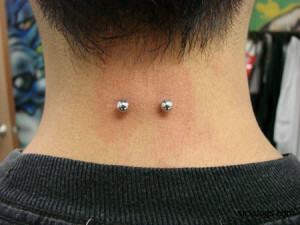 The preferred jewelry for this kind of piercing is barbells and surface bars made from Teflon or Tygon. Titanium is also a good option as it has a lessened chance of causing skin irritation. Wearing jewelry of steel or gold may result in infection and swelling. Though the cost of piercing may vary from one shop to the other the average cost may be about $50. 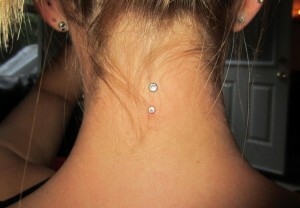 In many countries, the age of nape piercing is fixed to 16 years, keeping in mind the complications associated with it. 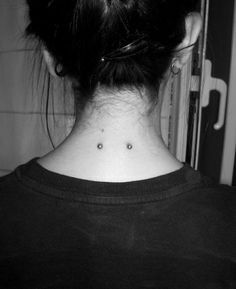 In this variation of nape piercing, a micro dermal anchor is implanted underneath the skin using a dermal punch or needle. The jewelry is put into the threaded hole of the anchor giving the appearance of a stud.